Product prices and availability are accurate as of 2019-04-18 05:12:45 UTC and are subject to change. Any price and availability information displayed on http://www.amazon.com/ at the time of purchase will apply to the purchase of this product. The new SENCO ® SHF50 Pneumatic Hardwood Flooring Nailer is ergonomically designed with the hardwood installer in mind. It has a rugged composite base to virtually eliminate scratching and damage to the wood surface. It's also the industry's only pneumatic hardwood flooring nailer with a work contact safety, which is activated when the tool is positioned on the flooring tongue, not by depressing a trigger. Easy on the arm, requiring only 4 lb of swing weight. Mallet-actuated firing simultaneously sets floor boards (tongue into groove) and drives cleat nails at an ideal 45 °angle. The only pneumatic hardwood flooring tool with a work contact safety, which is activated when the tool is positioned on the flooring tongue - not by depressing a trigger. Unlike staples, cleat nails minimize wood splitting and still allow for expansion and contraction of flooring materials. Mallet actuated (mallet included). Ergonomically designed for improved productivity, ease of operation and less fatigue. SPECIFICATIONS: Drives 1-1/2", 1-3/4" or 2" L-shaped cleat nails. 110 cleat capacity. 70 to 120 PSIG. Sequential action. 17.75 H x 16.25 L. 12 lbs. tool weight. 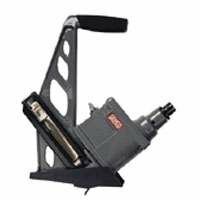 Senco Products, Inc. Pneumatic Hardwood flooring Nailer 710001 SENCO PRODUCTS, INC.